I recently had the pleasure to meet Wayne Stehbens who became Katnook Estate’s first winemaker in 1980 and remains so today. He guided us in a vertical tasting of the estate’s Cabernet Sauvignons. This year saw the release of the 2011 vintage, and the tasting was about the celebration of 30 years of Cabernets. We tasted the 2011, 2010, 2002, 2000, 1999 and 1997. OK, not exactly ‘old’ by Europe standards, but when was the last time you tasted a 15 year-old Australian wine? Katnook is situated in Coonawarra, the wine region famous for its terra rossa soil. Wayne believes Cabernet Sauvignon benefits from this red sandy clay loam on limestone and the surprisingly cool temperatures (highest 27ºC and average 19ºC in summer), resulting in a freshness and structure that Cabernet Sauvignon from warmer regions lacks. The younger Cabs have the unmistakable mint and eucalyptus of Coonawarra, with fine tannins. I like the 2000 and 1999. The former has a good balance between ripe fruits and aged cedar notes, while the latter is of an elegant savoury character. The wine is nowhere near as complex as a fine Bordeaux but, at just over HK$200/bottle at Watson’s, I don’t think there is anything to complain about. The same evening I was judging at The Sovereign Art Foundation French vs Australian blind tasting charity event, where both judges and guests scored 12 pairs of French and Australian wines of similar class and quality. While the judges gave more high scores to the French wines, the guests much preferred the Australian counterparts. An honest reflection of consumers’ palates? Katnook is available from Watson’s Wine Cellar. What would you make of a successful American financier owning a winery in Tuscany? A rich man’s hobby? Well, that was what I expected until I talked to Tim Grace, an American from Ohio and owner of Il Molino di Grace. 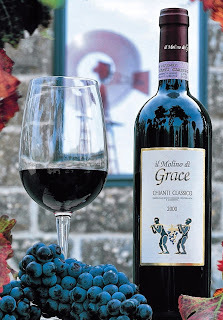 Il Molino di Grace is a family vineyard located in Panzano, a village in the Chianti Classico region. There is quite a story behind it. Tim’s parents, never having travelled outside the US before, moved to the UK in the late 60s and then went for their first European holiday in Panzano. The Tuscan landscape was a complete contrast with Ohio’s; they loved it and kept going back for holidays. Eventually, they took the plunge and moved to Chianti—but it had to be Panzano. It took them eight years of hunting until they finally discovered Il Molino di Grace in 1996. The property was only a vineyard and the grapes were sold to other wineries. Tim’s parents, jumping through all the hoops of Italian building regulations, finally built a winery, uprooted the ‘foreign’ vines such as Cabernet Sauvignon and Syrah, and began to focus on making what makes Tuscany wine famous: Sangiovese. Tim explained, "Sangiovese is a food wine so should not be overpowering. Blending with even a little Cabernet or Syrah will make the wine too dominating on the dinner table." Il Molino di Grace has five wines and all are 100% Sangiovese except the entry level Il Volano, which has 25% Merlot that Tim believes softens the Sangiovese making the wine more accessible. Even the IGT Super Tuscan Gratius, the top wine and obviously named with the American market in mind, is 100% Sangiovese. With a production of 350,000 bottles a year, Tim assured me that he is not a hobby winemaker. The money generated by the winery is less than what he used to earn in his previous career and has to be reinvested in the winery. However, he is much happier and derives more satisfaction from the new challenges. His wife is from a family that has run a high end cooking chocolate factory for generations since 1868. Tim hopes to build a family business that will mean something to future generations. For this reason, the vineyard is 100% organic and managed in a sustainable manner. One of the many challenges Tim faces is to persuade potential customers to try Italian wine. He compares drinking Italian wine to bungy jumping. You stand at the edge of the cliff and are scared to jump, but once you’ve done it, you want to do it again. Italian wine can be confusing because of the names and native varieties but it is great value for the quality and you’ll keep coming back for more. Hmm, I’m not sure about the analogy with bungy jumping (I haven’t tried it and definitely won’t in my life time! ), but I totally agree with the price/quality point. I admire Tim and his parents for their spirit in pursuing their dream, even more so because Il Molino di Grace is making a wine that is true to its history and place rather than chasing the market. I wish him all the best. We tasted six Grace wines, and I was particularly impressed by the Chianti Classico Riserva DOCG 2006—dried leaves, leather and spices on the palate supported by a fresh acidity—and the Chianti Classico Riserva Il Margone 2005, an elegant wine with a savoury palate and well-integrated structure. 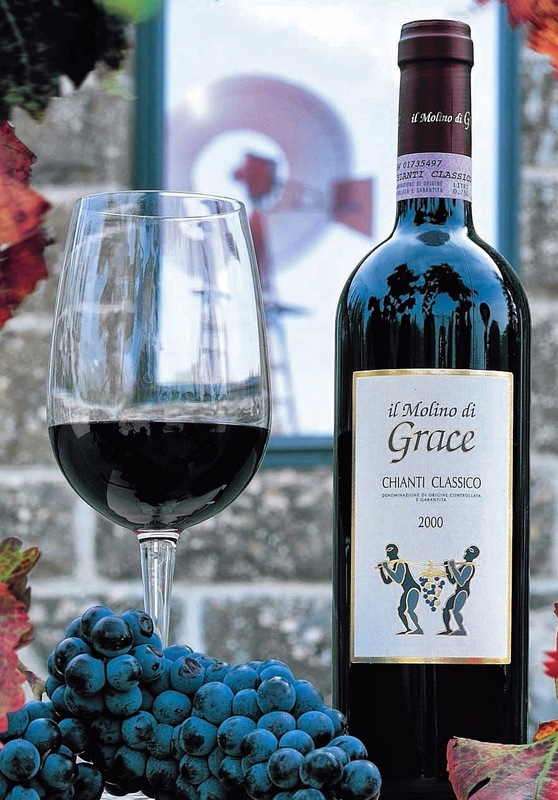 Il Molino di Grace is available from Altaya Wines.